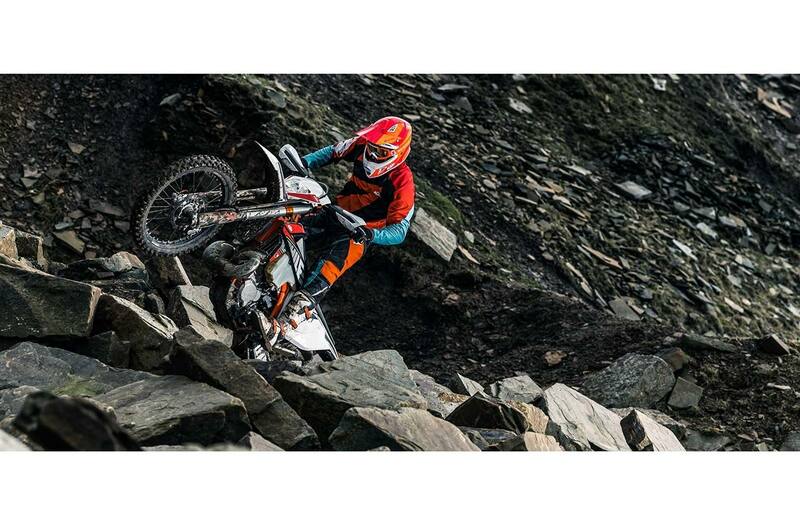 Six Days, Six Wins: KTM celebrates its prowess in the world of offroad racing with the 450 EXC-F SIX DAYS. 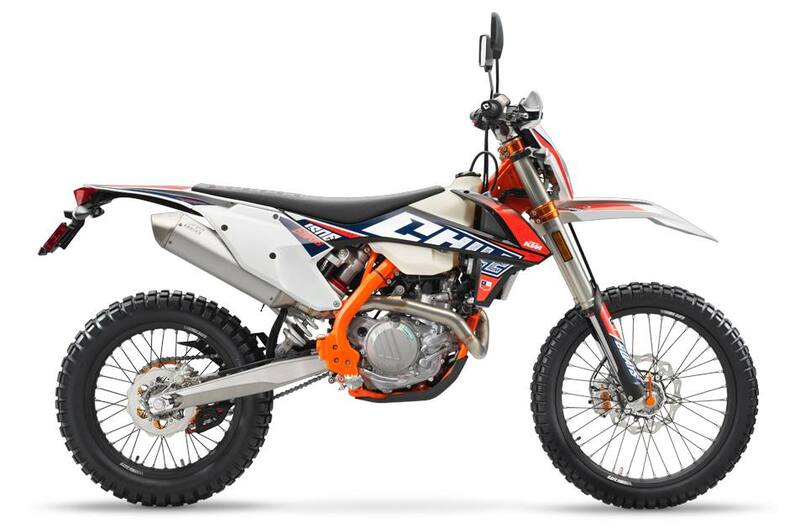 Built to perform under the toughest race conditions like those found at the Chilean ISDE, and boasting componentry, it is well-equipped to take on anything thrown at it. The hugely successful KTM 450 EXC-F power plant has kept its key ingredients the same for 2019 - compact dimensions, relentless performance throughout the rev range and low weight. Fitted with a single overhead-camshaft cylinder head and the latest electronic fuel injection, it churns out horsepower in line with what you'd expect from a pure-bred factory race weapon. Engine management system: The state-of-the-art Keihin Engine Management System with electronic fuel injection features an all-new 42mm throttle body. Thanks to its unique injector position, the engine's response gives a whole new meaning to the word ‘instantaneous'. And to make life even easier, separate systems for cold starts and idle adjustment await you. Push the throttle back when the engine's alive and well, and the cold start mode disengages. Just like the rest of its SIX DAYS brethren, the 450 EXC-F SIX DAYS shares a race-winning chassis setup. WP suspension keeps the wheels planted, while weight-saving efforts and performance-orientated materials ensure riders and racers are well-looked after on the trail or on track. Front suspension: The all-new WP XPlor 48 upside-down fork is a split fork developed by WP in close collaboration with KTM. It is fitted with a spring on both sides but features separated functions for each fork leg: compression damping is fitted on the left side, while rebound is on the right. So the forks can easily be adjusted for compression and rebound with the twist of a dial on the top of the forks. In addition, a longer and sealed hydro-stop guarantees better resistance to bottoming-out. Due to high-quality materials and a state-of-the-art production process, the new XPlor 48 fork - with approx. 300mm of travel - has outstanding response and damping characteristics and is about a half of a pound lighter than its predecessor. Triple clamp: All Six Days models are fitted with high-end CNC machined triple clamps anodized in orange with an offset of 22mm, ensuring a solid grip of the fork and precise handling. The handlebar is adjustable forwards and backwards over 4 positions, so the bike will fit you like your favorite gloves. Brakes: You can't brake any harder, better, faster or stronger. High-tech Brembo calipers are combined with lightweight wave discs and feature a reduced piston diameter for better modulation. The rear brake now features a 10mm longer brake pedal, and less aggressive brake pads are fitted front and rear. The steel-flex front brake hose gets more efficient protection and there's an integrated channel for the speedo cable. First you outrun them, then you outbrake them. Enduro racing is all about tough, technical terrain and fast, wide-open straights. It goes without saying that riders need to be able to move about the bike freely. With that in mind, KTM has ensured that the same READY TO RACE ergonomics of 2018 has been retained for 2019. Flying the Chilean colors for 2019, the plastics on the 450 EXC-F SIX DAYS share the same I-beam structure on its front and rear fenders as the rest of the multi-race winning enduro range. This guarantees maximum stability and low weight thanks to well thought-out construction and mounting points. A state-of-the-art Keihin engine management system with electronic fuel injection features a unique injector position to give instant throttle response a whole new meaning. The on-the-fly engine mapping settings keep the power delivery perfectly mated to every condition.